we are having warm sunshiney weather here for a few daze. i sunbathed yesterday and will be doing so today also. 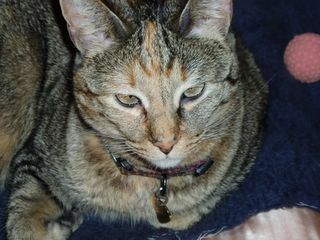 we are still purring for Lilly lu and Mu shue and fambly and fur pretty Miral who went to the rainbow bridge. Mom Laura is with her parents at their house.The damage to her apartment was not as bad as originally reported,mostly smoke and water (NO charred dust).She left the patio door open before leaving for work.A second search of the apartment today revealed no cat bodies!!! !They live on the 3rd floor, but the balconies overlap.There is a large woods directly behind her apartment. Laura JUST called! Mu Shue, Lilly Lu and Iris were found hiding in the apartment by the fire folks going around checking and they’re alive!!! They were hiding and they’re scared to come out for strangers. They’re still there, and she can’t go in yet because it’s unsafe, but Animal Control is going to go in as soon as possible!!! Laura is picking up new carriers right now. The fire people said they’d be ok overnight if it had to be that long, but they’re going to try to get the in tonight if at all possible. We are hoping, too, that LL, MuShue and Iris escaped down the balconies. So you think that shelter cat is handsome?? More handsome than I??? Enjoy the sunshine.I'm purring and mom's praying.